Honestly, Labor-bashers, Face the Facts! This reader’s letter to the Canberra Times really got my goat. OK, so I’m a Laborite and so my hackles rise whenever I read criticisms of my party. But what really gets me is the blatant misrepresentation of facts and figures to suit the LNP’s political agenda. And what really, really gets my back up are the LIES, LIES AND MORE LIES peddled by the Abbott Government, its lackeys and supporters among the MSMs. This one is typical — given pride of headline space by the Canberra Times in its Comments section, despite it being clearly just parroting LNP spin. So I fired off a riposte. As it may or may not see the light of day in the CT, here it is in my own blog (three cheers for the coming of the Internet Age). 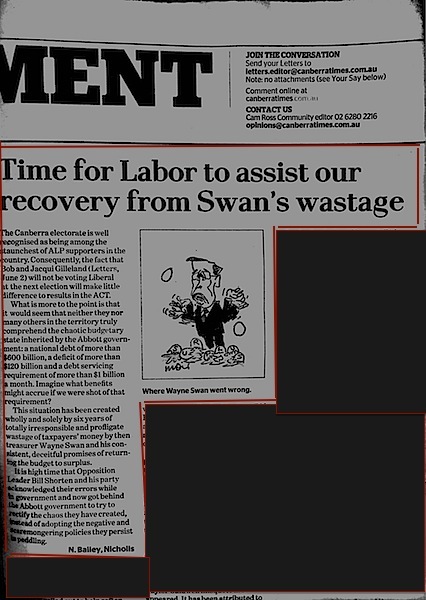 I feel I must respond to N. Bailey (Letters, June 2), in which he/she lays full blame on Labor and former Treasurer Wayne Swan for ‘wastage of taxpayers’ money’ that led to the ‘chaotic budget state inherited by the Abbott government’. Bailey’s letter is simply echoing the Coalition government’s ‘budget crisis’ spin which contains a lot of misrepresentation of facts and false assumptions. I point out these facts: (1) the figure of $600bn is a a figure based on Treasury projections spanning the years to 2023/24, and the Coalition’s own pessimistic assumptions and recent spending decisions (e.g. PPL, new jet fighters). It is not as if Labor had left that amount as actual debt (incidentally, if Treasurer Joe Hockey was so perturbed by the debt level, why did he seek to increase the debt ceiling to $500bn?). (2) $600bn (the exact figure is $667bn) does not represent just gross national debt, but also debts incurred by state and local governments (which comes to roughly $282bn). (3) Half of the $667bn are in the form of Commonwealth Government Securities – treasury bonds bought by foreign investors – which provides the cash flow for big spending such as future superannuation payments for public servants and defence personnel, and for infrastructure programmes (NBN, for example) — note that these extend over a long term. (4) Actual net national debt is only a tenth of the $600+ billion. Labor left with a deficit of $30.1bn — if it is now much more, it is the Coalition government’s doing. While it is true that Labor under Rudd/Gillard increased spending, this was chiefly to provide the needed stimulus through cash grants for low-income groups and infrastructure projects that saved the Australian economy from the GFC. Labor spending reached a peak of $54bn during 2008-09, but by end of its term of office, the deficit had gone down to $18.8bn, or 1.2% of GDP (the average for OECD countries was 4.9%). In terms of wasteful spending, the only years that an International Monetary Fund study found to be the most profligate (IMF Working Paper 13/5, January 2013) were during the Howard years. All that surplus from sale of public assets gone, giving out middle-class benefits and other non-productive goodies in the months leading to the 2007 election. If Howard had left the surplus intact, the incoming Rudd government would not have needed to spend quite so heavily to soften the impact of the GFC on the economy . As the Nobel Laureate economist Joseph Stiglitz remarked: “For an American, there is a certain amusement in Australian worries about the deficit and debt: their deficit as a percentage of GDP is less than half that of the US; their gross national debt is less than a third” (http://www.project-syndicate.org/commentary/the-crisis-down-under#4gzrISdmXj3TScB9.99). Add to that the fact that Australia under Wayne Swan’s fiscal stewardship became one of only 10 nations in the world to get a AAA rating from three major global credit agencies, and Wayne Swan himself named Best Finance Minister of the Year by the esteemed financial magazine Euromoney for successfully steering the country through the GFC, The only other Australian Treasurer to have that distinction is —wait for it, N. Bailey — Paul Keating (need I say, also under Labor government?). GINA RINEHART thinks she has the answer for congested prisons: let criminals buy their way out. It is also, as she points out, one way to increase the government’s revenue. She is being true to her beliefs: MONEY IS THE ANSWER TO EVERYTHING. Never mind that one function of prisons is to rehabilitate, not just punish, offenders. Another is deterrence – a criminal is less likely to reoffend after incarceration. Does Gina not even think that such a scheme could lead to more crime – albeit “non-violent” as she puts it? Drug dealing, for example, is potentially non-violent. So, after being convicted of selling a large shipment of cocaine to school children, I simply pay my fine and go back to business. So – no problem at all if you’ve lined your pockets from dodgy dealings a la Bond, Skase or Adler, but if you’re some poor bugger from skid row — in the cells, mate!